She was said to have split with new beau Mechie earlier this week. 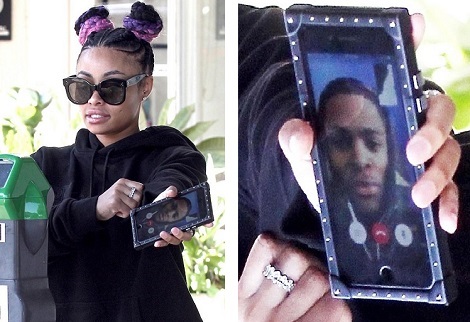 But Blac Chyna proved she was still talking to the rapper as she was seen FaceTiming him as she headed to a salon. The 29-year-old former stripper held her phone for all to see, which made it clear she was back on speaking terms with her latest squeeze. The mother-of-two stepped out to a salon in Beverly Hills, California, wearing her omnipresent uniform of a tracksuit. Her hair was wound into braided dual buns. She emerged having channeled 1990s Michael Jackson, with a long straight blow-out. » Blac Chyna Goes Into Pre-labour After Watching The US Presidential Election?